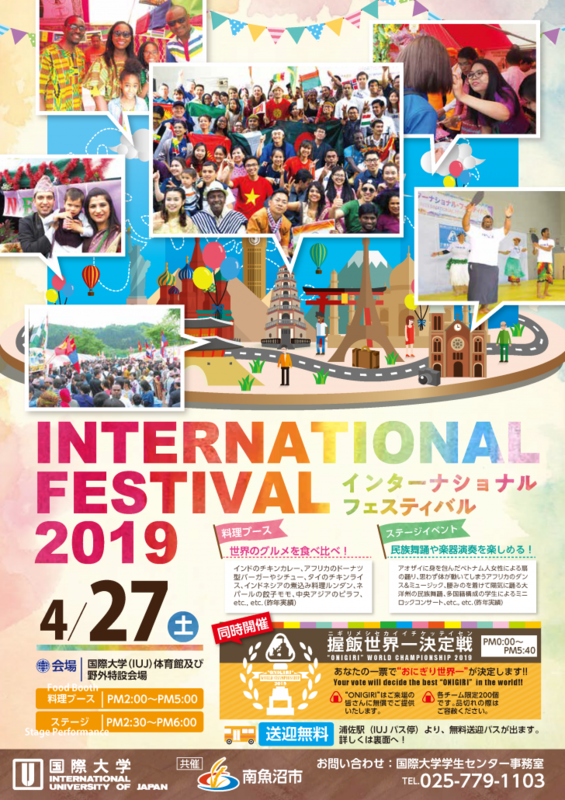 IUJ invites you to its annual school festival “International Festival.” Enjoy international dishes prepared by IUJ students. Feast your eyes on a 3-hour stage show displaying some of the 60 cultures on our campus, including Japan. This year again, as a special feature, 6 IUJ teams will take on the “Onigiri World Championship.” They will create an original onigiri “riceball” dish to combine Japan’s traditional food made with the wonderful Koshihikari rice of our area with the flavors or their country! The Onigiri World Campionship is sponsored by the Niigata Prefecture and Minami Uonuma city. Meet IUJ students using English or Japanese to discover the world. This event is wonderful for children, young adults, adults, seniors and the elderly alike! Join us! 2:00pm – until they run out of food, service to the community inside the gym. Please note: Food services start at 2pm, and run for a few hours or until the food runs out. The stage show starts at 2:30pm and runs for about 3 hours. Entry is free. You may come and go freely. The Open Campus will be held on April 27th, too. If you are looking for a graduate school in Japan, please come to see our campus and diversity of students on the day.